With "NewDark" we can also use the new "t2skies" sky mod and HD textures for trees & bushes! 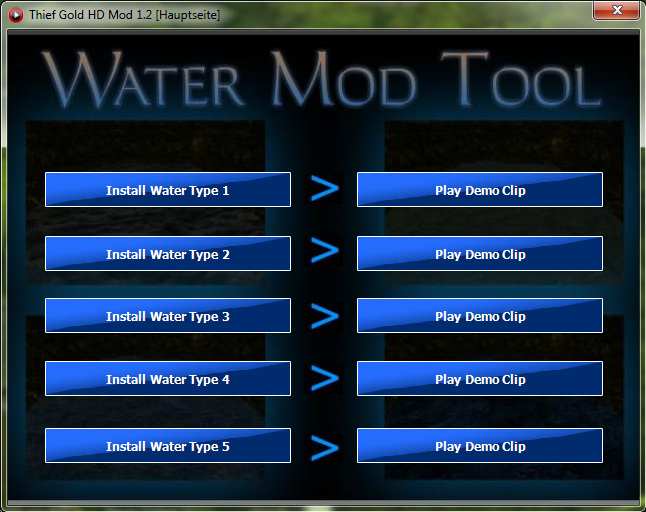 The HD mod brings also new HD water and lava. Preview video of the OM "The Haunted Cathedral"
- added new lava FX in "Into the Maw of Chaos"
- alarmlights in Break from Cragscleft Prison, Assassins and Undercover now light up when alarm is triggered! - added all Garrett's monologues on "Lord Bafford's Manor"
- added full english subtitles for all characters + german subtitles for "Garrett", "Cutty", "Murus" and "The Eye" ! - fixed a problem with a lava pool on "The Mage Towers"
- added new cobwebs objects on "Break from Cragscleft Prison", "Escape!" and "Into the Maw of Chaos"
- added new plant objects on "Escape!" - fixed the problem with the cellblock shields on "Break from Cragscleft Prison"
- fixed a problem with the spiders AI's on "Into the Maw of Chaos"
- fixed a problem with the "NewDark Graphics Settings Tool"
- added "NewDark Graphics Settings Tool 0.8" - use this tool to config your thief 1 graphics settings (Anti-Aliasing, Bloom FX...) There is also a ReadMe.txt! - fixed a problem with the "Water Mod Tool"
- fixed the problem with blue surfaces on "The Sword", "Escape" and "Into the Maw of Chaos"! - fixed the "difficulty" problem on "Escape!". - fixed textures / mission optimized "Break from Cragscleft Prison"
- fixed textures / mission optimized "Down in the Bonehoard"
- fixed textures / mission optimized "Assassins"
- fixed textures / mission optimized "The Sword"
- fixed textures / mission optimized "Into the Maw of Chaos"
- fixed textures / mission optimized "Escape!" - fixed the torches bug on difficulty expert "Down in the Bonehoard"
- fog FX changed "Into the Maw of Chaos"
- added two new .bat files for water surface textures (Now you can directly - disable / enable - all HD water surface textures about this two .bat files! 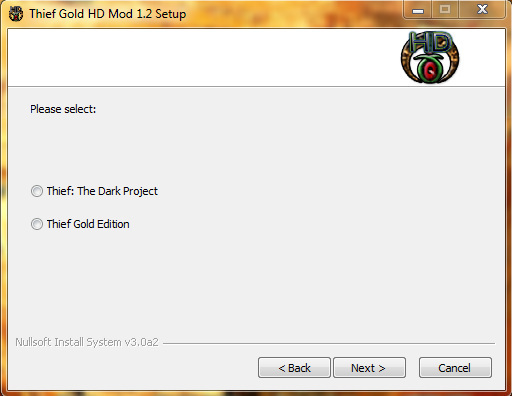 The HD Mod is now compatible with Thief: The Dark Project and Thief Gold! The new blood FX is disabled by default. You can activate it with the "NewDark Graphics Settings Tool". Don't use this tool for Thief 2! The game will crash! I've created a "Ultimate Difficulty Mod" gamesys file for the T1 HD mod. It's only for version 1.2! There is also a "Ultimate Difficulty Mod (normal AI speed)" gamesys. This means that the AI moving speed is normal here (original settings). To play with the custom gamesys, your simplest option is to backup your old dark.gam (file path \HDMOD\dark.gam) and replace it with the new one. * A lone guard who is alerted and makes a confirmed sighting of Garret or a body, searches for him, and gives up, will run to alert others instead of returning to his regular patrol. After that however, he will resume his patrol. * The AI vision cones have been completely redesigned to given them better distance vision, a more accurate loss of acuity over distance, and to eliminate Garrets ability to use leaning tricks to blackjack guards while alerted. * I have heavily modified the dynamics of noise creation as a result of Garrets footsteps. Running on wood and cobblestone now has the potential to alert guards within a few meters. This means you will have to *walk* up behind them for a successful blackjack. Also, creeping on marble, metal, or gravel is actually *quieter* and no longer alerts guards thus eliminating the need to tap the forward key and creep-crouch. * Garret is now more visible to AIs as the visgem will indicate. To offset this new disadvantage, I have increased the bonus Garret receives for crouching and sticking close to walls. * Bodies are now MUCH harder to hide. Forget about tossing your victim in a shadowy spot on a well patrolled hall. Only two things may effectively hide a body now: a physical barrier, or an area of nearly absolute darkness. * Residual alertness on guards who have been raised to level 3 now increases their perceptiveness by a considerable margin. * Yelling made by guards during combat or searching travels further and is heard more easily by other guards. * Blackjacking someone makes a minor sound disturbance. To play with the custom gamesys, your simplest option is to backup your old dark.gam and replace it with the new one. Load up Thief and be prepared to find a whole new challenge awaiting you in the missions you have grown to love. Any fan mission that doesn’t use its own custom gamesys will experience the changes as well. 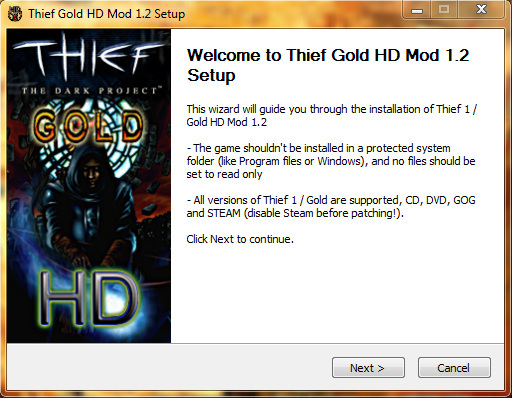 To restore your original Thief version, simply copy the DARK.GAM file you backed up back into the Thief directory. -Never try to run up behind a guard to blackjack them (unless they are the dimwitted ones that work for Bafford) Your default mode of travel should probably be walking from now on. -Be much more prudent when hiding bodies. -Take more time to consider your course of action and plan from the shadows. -Blackjacking is now a more risky tactic and should be used sparingly. -Plan your escape tactics ahead of time as the AIs won’t be quite so easy to evade anymore. -Be prepared to resort to less-conventional tactics to overcome a situation. Spots that were possible to sneak through on expert will be much harder if not impossible with this gamesys. -If guards are nearby, you may be forced to creep while walking upstairs to remain unheard. This is because the noise Garret makes is a measure of his total speed, not what movement mode you are using. I want to show some FMs with the HD Mod textures! Last edited by Gecko; 6th Jun 2016 at 07:32. Now those are very NICE When will it be ready?? OMG, a reason to play through yet again!!! Some very nice looking high res work here. Yet, I can't help but feel that many of the textures are so drastically different that the levels lose the feel of the originals. Brighter colors in a lot of places, some very busy designs in others, completely different stonework. I guess the goal is simply to use higher res textures, without retaining the look of the originals. With that in mind. Good work. I was too chicken to post until NH did. I know what a lot of work this must have been, which is why I was reluctant to jump in with a negative. I'm not even sure if constructive criticism will be helpful at this stage of the project. In almost every case, the colour palette of the scene is different (sometimes wildly so) to the original art, and the level of brightness is often noticeably higher too, which I think is a mistake. You've been pretty bold and certainly put your own stamp on the environments, so it's bound to divide opinion; no offense intended but it's probably not for me (I will try it out in-game though). okay, I want to change some things! Hey! Lets just assume that NH was right, ok? The textures you came up with may have completely altered the orginal intended atmosphere, but they made absolute sense, were very well done, and proves once again how masterfully the original levels were built. If this is accepted, then... this is still a pretty darn good reason to play through yet again! This looks terrible. It appears that most of the brickwork changes consist of replacing the textures with much smaller bricks that make no sense in their architectural context. The changes to the gold brickwork inside Bafford's are particularly horrifying. However, I applaud anyone who releases any high resolution textures for T1/TG, since so far we've had practically none. - yes, in that it might have been better to have just cleaned up hi-res version fo the original texture. - no, in that the higher res textures allow for immersive and perceptional game play. Forgot to say, good work so far gecko, keep it up...!!! Last edited by bikerdude; 18th Mar 2011 at 20:09. What a new and exciting development. Anyways, I was blown away by the detail in the Haunted Cathedral screenshots, man. My only quibble would be with the window textures in Constantine's mansion. If you can figure out how to make them work on that domed, glass bit, it would look really great, I think. I say this as an art major. You say everything in the manner of an art major. We're all quite used to it. Yeah well, that's like... your opinion man. I defy you to find one other time I've mentioned it. I am curious, where did you find the source images for the textures. I recognise a lot of CGTextures images, but where else? The textures are very good quality, but they completely change the look of the game. That was also my biggest problem with N-TEX, and why I personally never used the thing. A texture upgrade project needs to at least try to maintain the original look and feel of the game. Something as completely different as this is best suited to a mod or, better still, to be used as assets for FMs, rather than an outright replacement. A prime example of what's wrong with this is the extremely unique stained glass used in Constantine's manor. Its very specific look of large, oddly-shaped segments is replaced with a uniform collection of tiny panels, a completely different colour, and the iconic ceiling rose (as seen in cutscenes) is replaced with a generic circle of the same tiny glass panels. Excellent work ! Much much nicer than the originals. Some of the screenies looked almost photographic ! Looking forward to the future download ! Like some others said though some of the brickwork needs enlarging. Apart from that, I preferred your work to the original every time. Is it TG though ? Looks like T1 screenies to me ? Yes, I am such a deep fanatic of this game, that I will take any reason I can get to play it again. After 10+ years, are you kidding me? I am playing this! Get these textures out there man, HURRY!!!! Well, it certainly looks like a lot of deviation from the base textures. Not that it looks bad, but that it sort of loses the look of the original game by giving it such radical new textures. Overall though, I would like to see more deviations from the original texture set come out soon, so that we may have better textures overall. In other words, I'm in favor of some deviation, so that we all nitpick and create the perfect set. Last edited by Albert; 29th Mar 2011 at 19:39. I tend to agree with the detractors. The work itself seems ok but a lot of the time it ends in mucking with the colour scheme and architecture, intentionally or otherwise, for unpleasant results. Eg. Bafford's manor's front portal is now made of rough cut slate or flint. You can get away with that in a basement (just, by pretending the retaining walls are behind it) but not in a clearly solid structure like that except in maybe cladding the lower sections. And you've got things like the yellow brick work inside doesn't look like structure any more but that decorative crazy stone from a 1950s fireplace. You can't just change friezes and stained glass to whatever you like either. Lots of those things have meanings (and some noble's tomb lid being replaced by what looks like a statue, possibly of Plato? Not a good idea). The texture in the domes of Bafford's little towers now has no relevance to anything too. The simpler textures on carpets and walls tend to work better with an old engine like this. Replacing them with a whole lot of much busier things of different colours can make things worse rather than better Plus there's unintended consequences like the altar top in Cragscleft. The designers had a flat undetailed texture on it that was more general purpose. Now it looks like it's crudely cut parquetry, which makes no sense at all. If you're not going to custom fit the new textures to the scenes (a pretty much impossible task requiring hand editing and redistributing the missions), sticking as close as possible to the originals in every respect is the only way to go. Otherwise I think the effort is wasted, sad to say. Some do fit pretty well. Others do not. Keep at it though.